Listen to Enrico Caruso, Frank Sinatra, Tony Bennett, Dion, Bobby Darin, or any of the songs in the book by clicking on the iTunes playlist link below. Mark Rotella joins WPR to talk about some literary standouts of the year. Mark Rotella chats with Helene Stepinski about her new book Murder in Matera: A true Story of Passion, Family, and Forgiveness in Southern Italy. Mark Rotella offers an appreciation of autobiography finalist Nigel Cliff’s Moscow Nights: The Van Cliburn Story—How One Man and His Piano Transformed the Cold War (Harper). A round table discussion of the past, present, and future of Italian/American literature that includes readings and discussion with writers Anthony Julian Tamburri, Fred Gardaphe, Robert Viscusi, Louisa Ermelino, Maria Lisella, Mark Ciabattari and Mark Rotella. Rotella discusses the results of a recent study suggest that reading literary fiction increases empathy, or the ability to understand others' thoughts and emotions. Rotella discusses late Doo Wop singer in the New York Times. Rotella interviews Magnus Nilsson, proprietor of Sweden’s Faviken restaurant and author of The Nordic Cookbook, and discusses meatballs, herring, and open-faced sandwiches. Rotella talks discusses the trend of cookbooks for men. Rotella talks about crooners in the PBS documentary The Italian Americans. Rotella among eight new NBCC board members. Rotella comments on cookbook sales in the digital age for ABC News. Rotella makes Muck Rack's list of Publishers Weekly's top tweeting staff members! Mark Rotella, author of Amore: The Story of Italian American Song and Stolen Figs and Other Adventures in Calabria and Marilyn Horne speculate: Could Lanza have had a career on the opera stage? Was his voice only fit for recording studios? The show includes Lanza performances of arias and songs, so you can hear for yourself. Publishers Weekly cordially invites you to join our virtual luncheon to discuss the newest trends in cookbooks. Hosted by PW senior editor Mark Rotella, this sponsored roundtable discussion will also address issues of acquiring cookbooks for libraries and bookstores. The panelists will inform you about how they are marketing and publicizing cookbooks in today’s new cookbook marketplace, and the impact that e-books and recipe apps have had on their publishing decisions. Panelists include Bob Dees, President of Robert Rose, Inc.; Adam Salomone, Associate Publisher of Harvard Common Press; and Venetia Davie, Global Vice President New Business Development at Parragon. Click here to register. Mark Rotella speaks about the cultural legacy of actor James Gandolfini on What's the Buzz on ABC News. Mark Rotella writes about the classic holiday film for NPR's Monkey See blog. Publisher's Weekly senior editor Mark Rotella and reviews editor Rose Fox and will host an hourly program every Thursday at 3 p.m. EST, in which bestsellers and book trends will be discussed, as well as interviews with authors. An Unforgettable Evening of Music! Host-Author Mark Rotella explores how a tidal wave of Italian-American singers dominated the pop charts for decades and set the musical standards ever since! For more info, download the pdf here. Whether in traditional or digital forms, the cookbook review/author interview is one of the all important pieces to any cookbook publicity campaign. As the publishing/media landscape becomes evermore crowded, publishers have to become more focused in who they pitch and how. In many cases, the straight press release with an offer for an interview just isn’t enough and getting creative with both pitches and content can be the difference in getting a big publicity hit. On this panel, we’ll hear from a number of media representatives in about how they’ve seen publishers innovate, what they’re looking for in this new media landscape, and how their own content initiatives are changing (and how publishers can capitalize on that change). NBCC News: Mark Rotella, David Hajdu "Tenement Talk"
Amore: The Story of Italian American Song With Mark Rotella in conversation with David Hajdu at Sadie Samuelson Levy Immigrant Heritage Center. Rotella comments on new cookbooks. Rotella comments on Diane Keaton's new book. Rotella is interviewed on The Faith Middleton Show. Rotella interviewed by Italian New York. Rotella's wife, Martha Bonta named Executive Producer, Live Events and Special Programming at WQXR. Rotella is interviewed on TV Guide's "Hollywood 411" cable show regarding a recent surge in celebrity-penned books. Watch the video here. Rotella is interviewed on trends in parenting book for CNN. Read the article here. If you’re a fan of those notorious Italian singers/song-writers like Frank Sinatra, Perry Como, Dean Martin and Tony Bennett, then you will want to check out Amore: The Story of Italian American Song at the 92Y Tribeca. Author Mark Rotella and singer Dominic Chianese (who played Uncle Junior on The Sopranos) will explore the success of the post-WWII and pre-Beatles era of Italian-American pop music. You can even expect Chianese to perform some of the pop hits himself. Amore will take you back to the golden era of Italian hits this Thursday, January 20, at 12:00 p.m.
Rotella (Stolen Figs and Other Adventures in Calabria), a Publishers Weekly editor and first generation Italian American, chronicles his reawakened affection for late-20th-century Italian American "roots music." 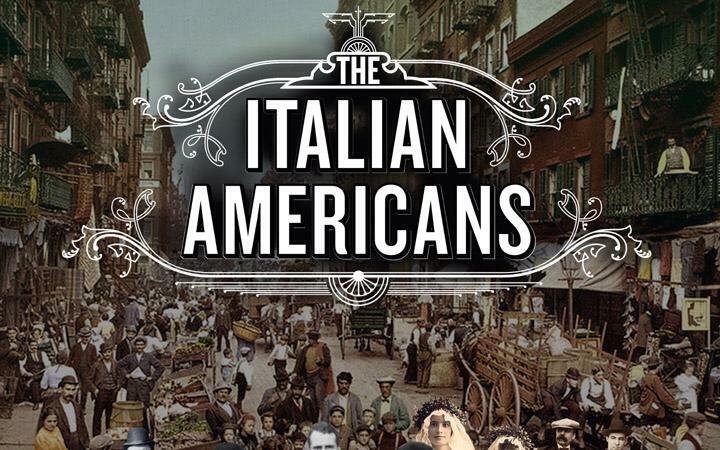 What's so special about the Italian American song? Rotella credits "a distinctive Italian American style — cocky and tender, tough and vulnerable, serious and playful, forward-thinking and nostalgic." Read full article. Amore: The Story of Italian American Song, by Montclair resident Mark Rotella, tells the stories behind the hits associated with a long line of Italian singers. The 40 chapters include several devoted to Hoboken’s Frank Sinatra, as well as Newark natives Frankie Valli (“Walk Like a Man”) and Connie Francis (“Mama”). Read full article. Speaking of talent, Mark Rotella’s talk about AMORE: The Story of the Italian American Song reminded me of so many of the big-name singers who I loved --- and who had talent. Rotella looks at the Italian Americans who wrote and recorded songs between the '40s and '50s. Mark Rotella, author of Amore: The Story of Italian American Song, discovered that no copies of his book were available for sale after his reading (fair staff found some later). He shrugged off the glitch and marveled at the fair anyway. "The whole outdoor environment is wonderful,'' he said. "I'm really impressed and heartened to see all the people here.'' Read full article. When Mario Lanza sang at the Hollywood Bowl in 1947, he was immediately spotted by movie talent scouts. His first two films That Midnight Kiss and The Toast of New Orleans introduced him to the movies. But the film The Great Caruso (clip, above) served as Lanza's breakout role. In playing Enrico Caruso, Lanza got the chance to honor his childhood hero and to inspire many tenors to come. Yet, the problems and pressures of his sky rocketing fame overtook his career. Lanza died at just 38. Ellisa Lanza Bregman, Lanza's only surviving child, remembers her father and the publicity around his sudden decline. Listen to the show. Mark Rotella talks about the “Italian decade”—the years after WWII when Frank Sinatra, Perry Como, Dean Martin, Tony Bennett, and other Italian voices established their smooth, stylish brand of pop. 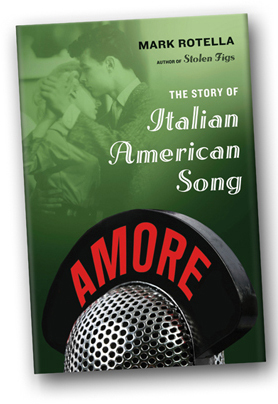 Amore: The Story of Italian American Song tells the stories behind 40 Italian American classics—from “O Sole Mio” to “Volare” to “I Wonder Why”—and shows how these songs became the soundtrack of postwar America. Read full article and listen to the show. Apparently, Dean Martin didn't much like the song "That's Amore," but in 1953 it became one of his biggest hits. It's a song that seems to capture a moment in pop history when nearly every hit was performed by an Italian-American singer. The story of "That's Amore" and the songs made famous by Frank Sinatra, Perry Como and others is told in a new book calledAmore. Weekend All Things Considered host Guy Raz recently spoke with the author, Mark Rotella, about Italian singers in 20th-century America. Read full article and listen to the show. From Caruso to Sinatra, a salute to Italians in American music. In the delightful Amore: The Story of Italian American Song (Farrar Straus & Giroux, $26), Mark Rotella spotlights 40 popular hits, from Enrico Caruso's "O Sole Mio" to Frankie Valli and the Four Seasons' "Walk Like a Man," to trace the assimilation of Italian immigrants and their music into mainstream American culture. It's the Publishers Weekly editor's second book exploring his ethnic heritage - Stolen Figs chronicled travels in his father's native Calabria - and both works grew from a personal crisis, as he explained to Newsday in a recent conversation. Newsday: You're writing about the music of your parents' and grandparents' generations. When did you to start listening to it? Mark Rotella: In 1998, when my wife was 32, she was diagnosed with breast cancer. She's fine now, but while she was going through treatment, we spent more time at home, and I was doing most of the cooking. I mostly cooked Italian food - that was what I was brought up with, what I knew - and I started listening to Italian music. It brought me back to a time, growing up in Florida, when we would go out to an Italian restaurant and it would be playing in the background, or sometimes at home my father would spontaneously start singing an Italian song. Looking back I see that I was creating a comforting little Italian household. After her treatment, we celebrated by going to Calabria with my parents, and that sparked "Stolen Figs." "Amore" combines history, music and biography in an unusual way. How did you come up with the structure? I found that I could tell the story of Italian immigration and assimilation through song. I learned with my first book that I tend to write in short chapters that each have a theme. What worked for me here was creating a songbook of not just my own favorites but big sellers, songs that really had an impact on America. Through each song, I tried to evoke the sound of the music, give a little background on the singer and also say what was happening with Italian Americans in general. N: You interviewed many of these singers in person. Did you have a favorite moment? MR: There were many. I spent years trying to get Dion to talk with me, because Dion and the Belmonts were really big with my father and his brothers and sisters. He finally called and said, "You've got 10 minutes." We ended up talking for an hour and a half! That was a wonderful surprise. N: The book ends with a moving description of Tony Bennett singing "Fly Me to the Moon" at Radio City Music Hall a few weeks after 9/11. What made you choose that for the finale? MR: I actually moved it from an earlier chapter. I liked the idea of a reprise, since I also wrote about Sinatra singing it; I like these two very different versions equally, for different emotions and under different circumstances. And I wanted to end on a note that reminds us these songs still resonate with us today. You may have heard that when the moon hits your eye like a big pizza pie, that's amore. When you read Mark Rotella's new book while a hit song by Tony Bennett or Perry Como runs through your mind, well, that's Amore: The Story of Italian American Song. Read full article. In 1958, the number one song of the year on Billboard contained the following lyrics: “Nel blu, dipinto di blu/E ci dice di stare lassu.” The song, “Volare,” recorded by Domenico Modugno and, more famously, by Dean Martin, was incomprehensible to most American listeners but it hardly mattered. As Mark Rotella writes in his new book, “Amore: The Story of Italian American Song,” the 1950s was the Italian decade in music, ruled by singers like Al Martino, Jerry Vale, Perry Como, Louis Prima, Bobby Darin, Dean Martin (born Dino Crocetti) and, of course, Frank Sinatra. One of the most influential periods in American Music occurred during the 40's and 50's. It was the infusion of Italian culture and styles introduced by Sinatra, Bennett and Martin. A new book AMORE: The Story of Italian American Song tells how the Italian influence began at the start of the turn of the 20th century with stars like Enrico Carusso but reached a new stratosphere with Frank Sinatra, Dean Martin and Tony Bennett. Listen to the show. 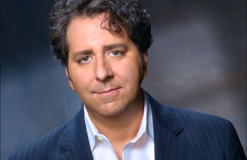 In his new book, Amore: The Story of Italian American Song (Farrar, Straus, and Giroux; September 14), Mark Rotella celebrates the "Italian decade"the years after the war and before the Beatles when Italian Americans crooners topped the charts and made the nation swoon. The stories behind 40 classics, like Frank Sinatra’s “I’ve Got the World on a String,” Frankie Lane’s “That Lucky Old Sun,” and Dean Martin’s “That’s Amore,” tell how these musicians’ smooth voices became the sound track of postwar America. Below, Rotella—a proud son of Italy and an editor at Publishers Weekly—recalls how Sinatra and Vic Dimone first crossed paths. Bob's Pick: "Amore: The Story of Italian American Song"
Like a big pizza pie, Mark Rotella's Amore: The Story of Italian American Song (Farrar, Straus & Giroux, $28) lands in stores this month with tales from such exotic spots as Canonsburg, where Perry Como found his voice -- and maybe sweaters. He needn’t worry. Stolen Figs received a starred review in PW and was part of the Borders Original Voices series. Both books reflect Rotella’s Italian heritage. He describes Amore as “a personal journey through music rather than a physical journey across landscape and terrain.” He guides readers through what he calls the “Italian decade” of the 1950s, when jukeboxes, the radio, and the ready availability of records and turntables turned singers like Perry Como, Dean Martin, and Frank Sinatra into superstars. In the book, Rotella chronicles what he regards as the top 40 Italian-American songs, interviewing many of the singers, including Vic Damone, Connie Francis, and Frankie Laine before his death in 2007. “Some were really receptive to the book,” says Rotella. “Many are still performing for sold-out crowds, be it Frankie Valli or Dion, who’s opening for Bob Dylan in Europe.” It took months for some to agree to talk with him, but once they did, many reminisced as if they were talking to a son or grandson. For others, like Frankie Valli, whom Rotella interviewed around the opening of Jersey Boys, the musical about Valli and the Four Seasons, Rotella may have been just one more interviewer. Rotella says that his wife accused him of writing the book so that he could play the music of artists like Jimmy Roselli at home and claim that he was doing research. But the truth is that he never stopped listening to the stars of the Italian decade. On his commute to work he still listens, but not exclusively. He sometimes switches to mid-’80s New Wave. © Copyright 2010 Mark Rotella | Site design by Michelle W. Nix. Programming by twinfountain.